Fitment: Only Fit for BMW F30 F31 F32 F33 F34 3 Series 4 Series. 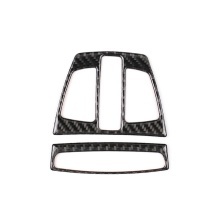 Material: Made of high-quality carbon fiber, lightweight, anti-rust, colorfast and durable. Protect Car: Prevent the surface of interior reading light from scratches, dust, keeping it clear all the time. Easy to install: No cutting or drilling required, No-Drilling DIY Installation. Function: Personalize and beautify your car in a simple way.